Covenant of the Plume is a strategy RPG in which you move up to four of your units in order to attack and defeat enemy units in a grid-like field. This sounds like every other Strategy RPG so far, however it is the battle mechanics that distinguish Covenant of the Plume from its competition. 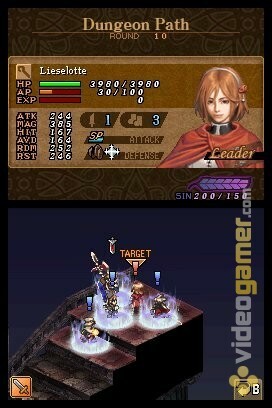 The timing-based attacks from the Valkyrie Profile series return and add a further layer of depth with the direction the enemy is facing. The true innovation comes at the moment to attack. 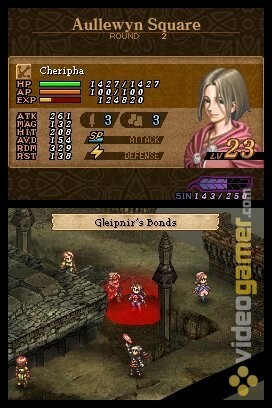 When a unit starts an attack on an opponent, all allied units who could reach to attack this same enemy will join in the attack, even if they had already taken an action previously, meaning that you could potentially unleash up to sixteen attacks on a single enemy (though very few enemies would require that much punishment) or alternatively decimate four opponents in a single turn if you make clever use of your unit placement. The only downside is, the enemy can also do this to you. If you are not careful, you could easily get curb stomped because of a small mistake, while it may seem that four-on-one is a bit like overkill, it is exactly that. In storyline battles, you will have an overkill requirement, meeting it at the end of the battle, will net you some rewards, but if you can gather even more that the amount sought, you can get more and better rewards for your effort. Key if you are in this game for the long run. Using those special attacks is almost too satisfying. While this core mechanics will always be in place, you have an additional tool at your disposal: the destiny plume, the eponymous plume that grants power beyond measure… for a price. 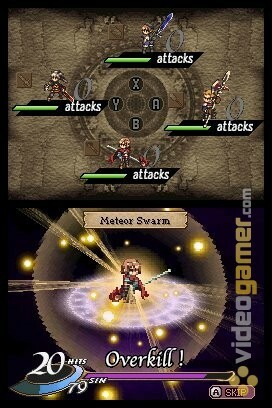 The destiny plume multiplies one of your unit’s stats by ten, essentially making them invincible, but when the battle is over, that unit will die, and the number of times you use the destiny plume will determine which of the three routes (and endings) you get, either A, B, or C. Obviously, never using it past the first time will put you in the noblest path, route A, which most people will likely try. But surprise! That path is the most difficult in the main story and you will inevitably be required to use the plume for the sake of survival (and narrative irony). Now if you play smart, you will take the darkest path, route C, and get yourself the best rewards and equipment you can get, and once you experience the bitter ending you get to carry over your equipment to a new route which will be far easier to dominate than otherwise, this may seem off-putting at first, but it is to your tactical advantage. In this way, darkness guides your redemption, and if you get all three endings you get to access a bonus mode that is as hilarious as the main story is grim (and that is a lot), but I will speak no more of that. The music for Covenant of the Plume stands out thanks to the efforts of Motoi Sakuraba, who brought back several pieces from the previous games in the series while adding several new tracks, most of them battle themes such as the synthetic tunes “Mighty Blow” and “Violence, Power, Enforcement” which carry an energizing rhythm that nonetheless remind us that war is not a cheerful affair, others are like “Endless Suffering” speak of what terrible world mortals live in with its somber tones and slow pace. Covenant of the Plume is by its nature either very easy or very hard (usually very hard). However, that nature allows it to pull off what I rarely ever see in most games, especially in an Strategy RPG, true team effort (AKA ganging up on other units) in fearsome, efficient, and overpowering fashion. As such, if you have an appetite for Strategy RPG’s such as Disgaea or Final Fantasy Tactics, Covenant of the Plume may not offer anywhere near the same level of character customization, but it does bring strategy and flair that neither of them can quite match. If you have the time and patience to spare, you will probably have little trouble securing a copy of your own. 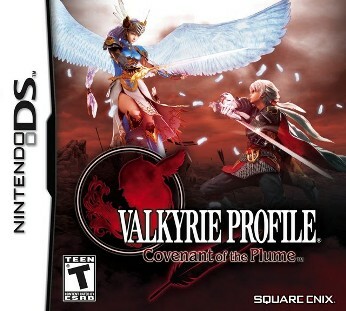 This entry was posted in Past Gen, Reviews and tagged 2008, covenant of the plume, Nintendo DS, Square-Enix, tri-Ace, Valkyrie Profile. Bookmark the permalink.